The holidays are a fond memory & winter is upon us…sounds like the perfect time to knit a little luxury for yourself! 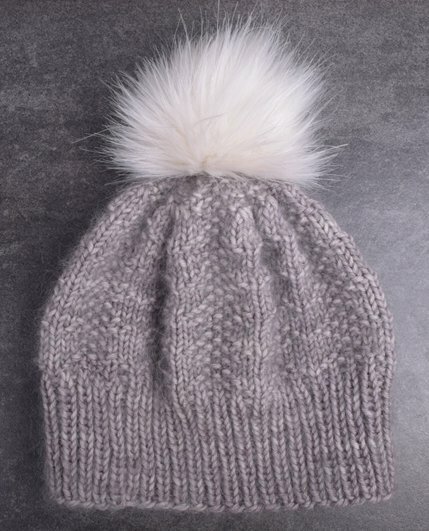 The Winter Luxe Hat by our lovely store manager, Laura Keiken, is truly an indulgent knit. Your hands will be very happy as you hold Madelinetosh Tosh DK together with luscious silk & mohair, creating a soft, warm hat with the most beautiful halo. Our top silk/ mohair choices for this hat are Rowan Kidsilk Haze & Shibui Silk Cloud. Both come in a wide range of luminous colorways to add panache to any project. The simple to knit, complimentary pattern requires just 1 skein of Madelinetosh Tosh DK yarn (or 225 yards DK weight yarn), 1 skein of Shibui Silk Cloud or Rowan Kidsilk Haze, & size US 7, 16” circular and double point needles. Other lovely yarn choices include Shibui Maai, Blue Sky Fibers Eco Cashmere, & The Fibre Company Acadia. Download the complimentary pattern on our webstore or visit our store to try on our two hat samples & find your perfect colorway.